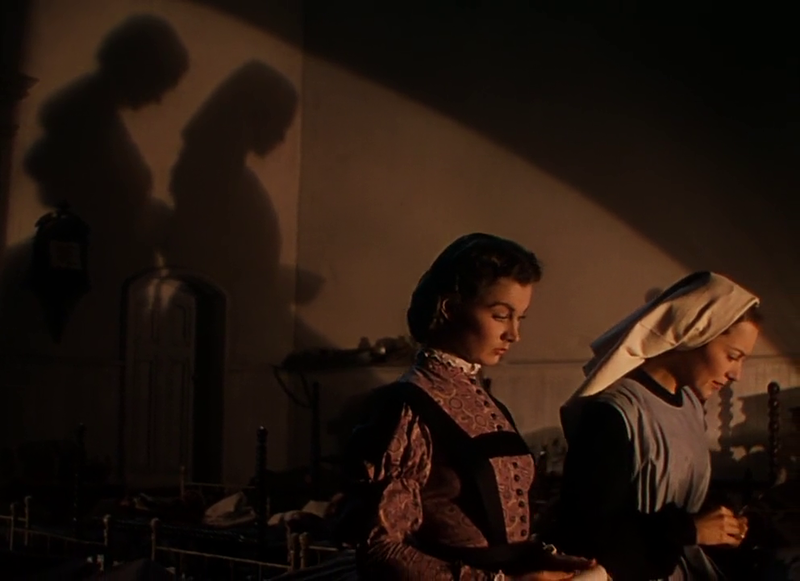 On the eve of the Civil War, a self-absorbed southern belle (Scarlett O’Hara) in love with her neighbor, Ashley Wilkes (Leslie Howard), is devastated to learn he’s engaged to another woman, the kind-hearted and noble Melanie (Olivia de Havilland). In a fit of spite, Scarlett marries de Havilland’s adoring brother (Rand Brooks), but he quickly leaves her a widow. 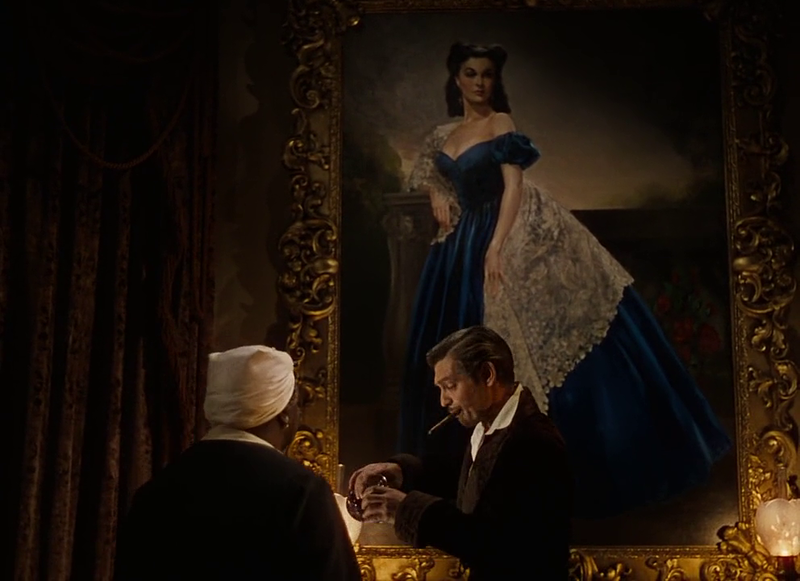 Businessman Rhett Butler (Clark Gable) — who knows about Scarlett’s undying passion for Ashley, but adores her anyway — doggedly pursues her, despite her lack of interest in him; that is, until she’s desperate to save her beloved, war-torn family property, the Tara plantation. Peary notes that this “most popular film of all time” — an Oscar-winning spectacle based on “Margaret Mitchell’s epic novel of the Old South“, and directed by Victor Fleming after the original director (George Cukor) was fired — was “given grandiose treatment by producer David O. Selznick”, and remains a “gorgeous film”. He writes it’s “exciting just to watch characters in their lavish costumes, or the fiery red skies that often serve as the backgrounds, or shots of the Tara plantation”, and points out the “picture has wonderful period detail and a fine assortment of characters”. He asserts that the “film defies criticism”, and that “suffice it to say… Leigh and Gable are perfect in their roles” given that “they are witty, dramatic, dynamic, glamorous, and boy can they kiss”. In his Alternate Oscars book, Peary gives the Best Picture Award to The Wizard of Oz (1939) instead, noting that Gone With the Wind “suffers because too many directorial styles are evident (also too many writers were employed), especially in the second half when interesting conflict (between the states and between Scarlett and Rhett) gives way to turgid soap opera”. 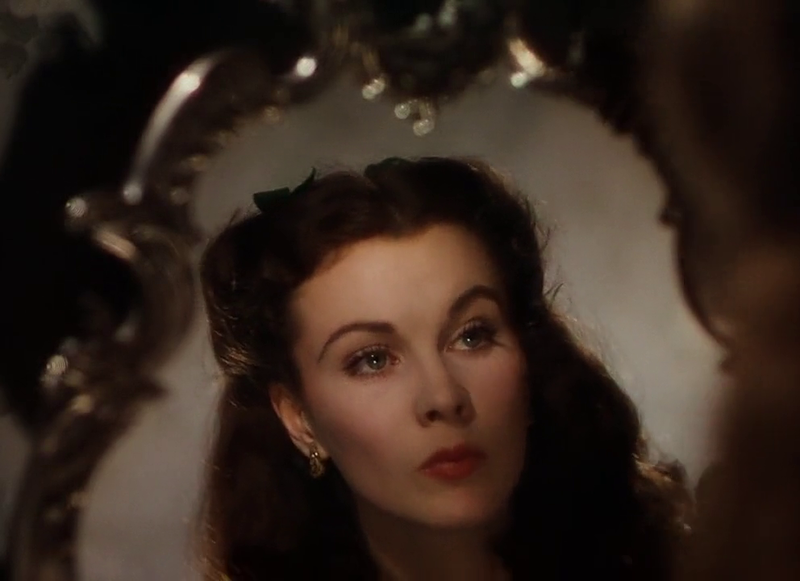 He agrees with the Academy’s designation of Vivien Leigh as Best Actress, however, noting that while he has “only limited fondness for the film itself” he believes that “Scarlett O’Hara stands as perhaps the greatest, most vivid female character in movie history” — “a direct result of Leigh’s performance”. He notes that “what may be [Leigh’s] greatest achievement is to make us feel compassion for Scarlett even when she acts disgracefully, because we realize she is hurting herself most of all”, and adds that Scarlett may be “so popular with female viewers because they realize she has good qualities — including her passion, her indomitability, and her intelligence” — while they also “understand her flaws”. I’m in essential agreement with Peary’s overall assessment, other than his assertion that the film defies criticism — of course, that’s not true. 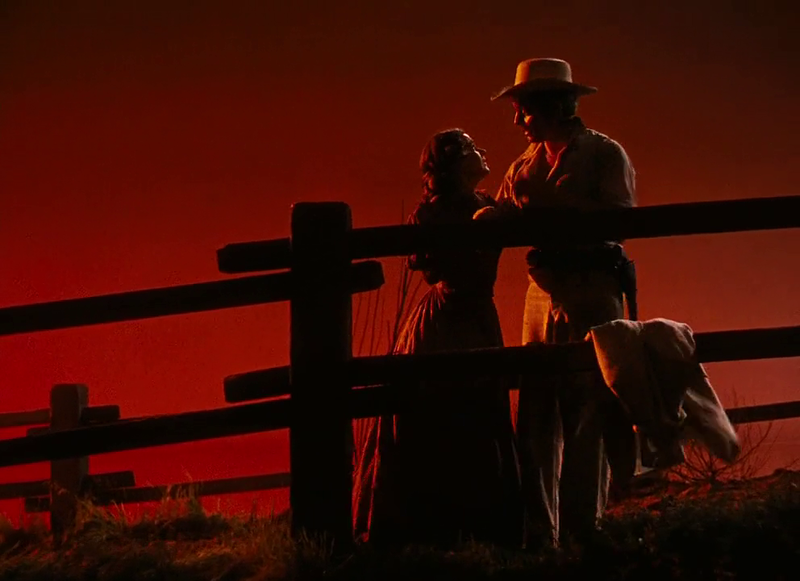 The most pressing challenge with this film is its highly problematic presentation of the South as a nostalgic haven where “after the Civil War, blacks miss the old slave South as much as the whites do.” In his review, DVD Savant brings a bit more nuance to the conversation, noting that “Rhett Butler and Scarlett O’Hara refer to darkies often enough to suggest the authors and Selznick like the sound of the word”, and that the film “treats ‘Mammy’ (the amazing Hattie McDaniel) with a troubling ambivalence” given that “she’s at first [simply] another source of comic relief but [becomes] a source of powerful emotions later on”. 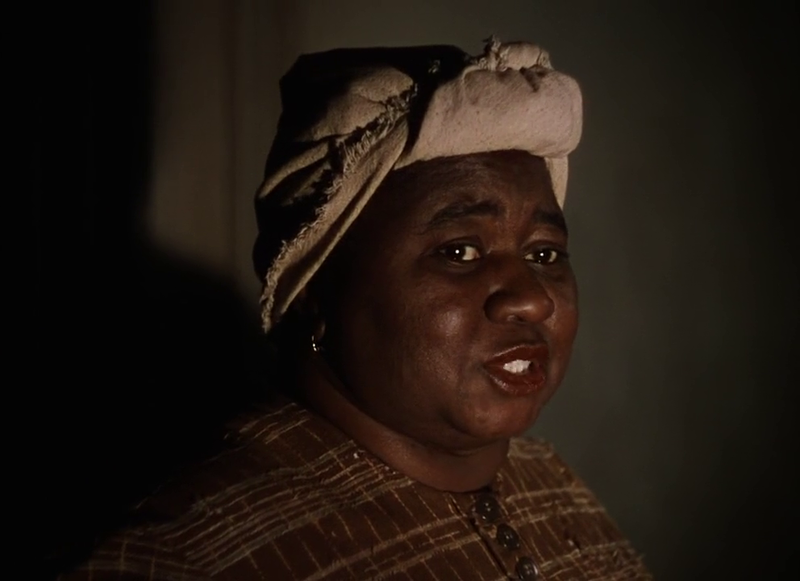 All of this and more — including Butterfly McQueen’s engaging yet ultimately demeaning depiction as “the bird-brained Prissy” — make the film deeply challenging to accept as any kind of a truly great film, in the same way D.W. Griffith’s The Birth of a Nation (1915) is impossible to analyze and discuss without enormous caveats. However, the treatment of slaves and former-slaves in Gone With the Wind are integral to its vision of characters fighting for a society in ruins, so one could argue the story itself required these distressing narrative threads. Speaking of the story, DVD Savant asserts that for “at least its first half”, the film “is wonderfully good storytelling on a grand scale”. That may be true, but the problem is that it goes on for twice as long as the best portions! Scarlett undeniably wears on one’s nerves — and while it’s true that Leigh’s performance is remarkable, she isn’t someone I relish spending any more time with than necessary. While GWTW was (and remains) a cult favorite for many, it doesn’t serve that role for me: Scarlett is insufferable, and having an entire story based upon her — especially when that story glorifies the racist, privileged ideology of the South — isn’t my idea of a good time. I first dutifully watched Gone With the Wind as a teenage film fanatic, and hadn’t revisited it until now; I was glad for the second viewing, especially given the stunning Blu-Ray restoration, but once again find myself ready to set it aside indefinitely. With all that said, there’s no denying film fanatics must watch this film at least once, simply to experience what DVD Savant refers to as the “first American Road Show epic of the sound era” — indeed, the complicated history of this film’s making is essential lore in cinema, and the recent (2014) publication of a book entitled simply The Making of Gone With the Wind (with a foreward by Robert Osbourne, RIP) demonstrates how enduring its legacy remains. 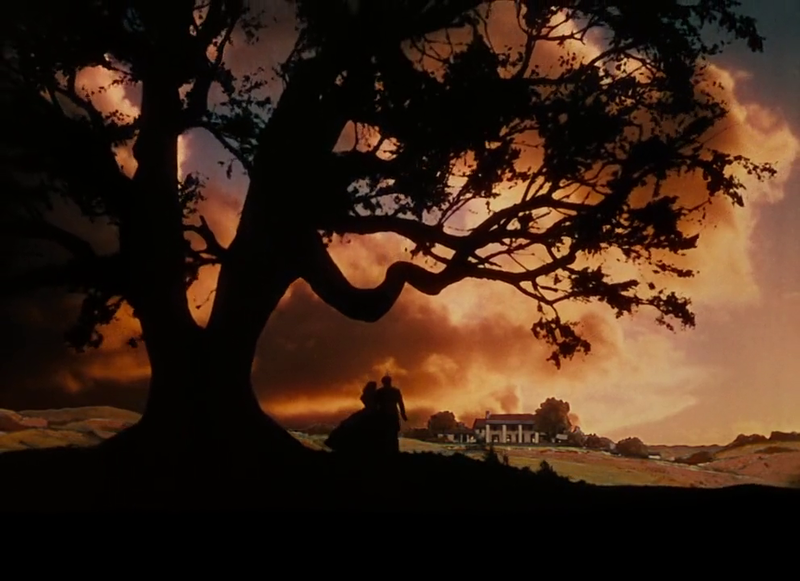 In addition to its instantly recognizable score by Max Steiner (in the top 3 for sure, if not THE top), countless scenes and images are burned in our collective memory: Scarlett and her father (Thomas Mitchell) standing under a sprawling tree looking out at Tara; Scarlett surrounded by her beaus at the opening picnic; Scarlett wandering the massive death fields of a post-Gettysburg landscape while the camera cranes farther and farther above her head; Scarlett making a hideous dress out of green drapes (so wonderfully lampooned by Carol Burnett and her crew); Rhett and Scarlett’s passionate embraces. All told, this nearly four-hour film remains legendary. Yes, of course, as a long-time classic. 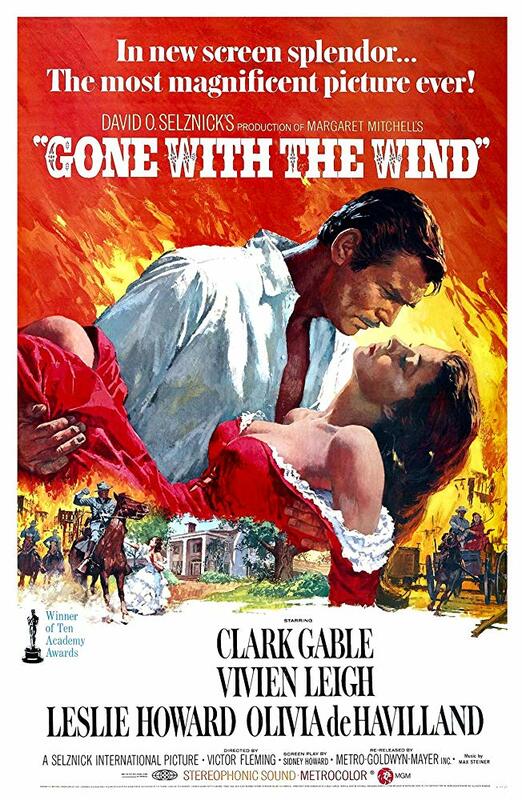 ‘Gone With the Wind’ (1939): It had been some years since I rewatched this ’40s-cusp classic – and I figured experiencing it in blu-ray was reason enough for a revisit. The film already still feels remarkably fresh in a number of ways but the upgrade certainly brings added value. I’ve somehow always felt that ‘GWTW’ almost singlehandedly ushered in the tone of the 1940s: the time had come in cinema to be bolder than ever, more ambitious. That almost seemed to be a subconscious collective thought among filmmakers of the time, considering that 1939 (as we know) was such a watershed year for films. When I was a kid, studios tended to periodically return some of their bigger blockbuster films to theaters – whenever ‘GWTW’ came back, my mom would inevitably want to go. So I saw this in the theater a fair number of times. Watching it again now, I’m still surprised by how well it plays – how quickly the time seems to fly by – the solid, fluid quality of the storytelling and how tightly it all holds together, considering the countless problems the production faced all along the way.